And there it is. I know I haven't shown side-by-side photos of late, but I figured I should for this one last time. 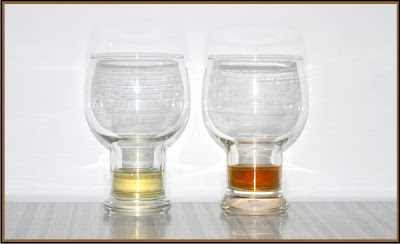 We have You can see that the whisky has transformed from a really pale yellow to a deep red-orange. In the bottle, it's even more pronounced. Come to think of it, why don't I let you see for yourself? The Whisky Works is by far the darkest whisky I own. It's deeply, deeply, red orange. I don't know what would happen if I watered it down to 40% and I'm unwilling to do so, as it's an irreversible process, so we'll just have to live with the mystery. The nose is wonderful and complex. I would say that this is the nicest nose of any whisky in my collection. It's a lot bolder than any of the others, that's for sure. It's robust. 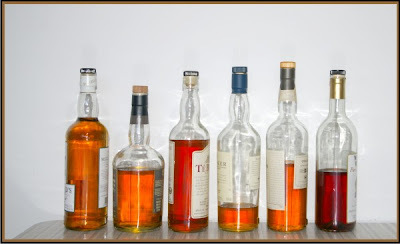 Oban and Talisker are also wonderful, but they're really delicate in comparison. I detect spices, raisins, brown sugar, oak, toffee, butter, chocolate and vanilla. The faintest salty tang, just a hint of grass, and such a subtle smoke that you'd miss it if you weren't looking. The un-aged version is insipid in comparison. Malt vinegar, grass and grain. The transformation is astonishing. The palate is also very, very nice, though different from the nose. The oak really comes through all the way from start to finish, as does a warming spice. A nice wave of butterscotch comes through right in the middle, followed by dried cherries, raisins and apricots. Underneath, a nice vanilla and dark chocolate combo. When I hold it in my mouth, the fruit becomes much more pronounced. It smells sweeter than it tastes. There's a pungency to it that's difficult to place. Marsh? Seaweed? Tar? Not quite any of those, but something along those lines. I don't know: it works, whatever it is. The finish moves from oak to prune and back again, with a nice warming glow throughout and unsweetened chocolate creeping through underneath it all. This time, I added a splash of water to see what happens. The water is charcoal-filtered and thus pretty tasteless, which is good in this case. The nose becomes more subtle immediately. The spice drops right down, and the butter and brown sugar come together in dramatic fashion. It's also got more malt on the nose, and more smoke. It smells very smooth. Water makes it sweeter on the palate. The bitter dark chocolate is replaced by milk chocolate, and the raisin-cherry-apricot combo is more apparent. The oak is still there, but it's more understated. More butterscotch as well. The finish remains long, but the dark chocolate undertones have turned into a semisweet chocolate wave. It's less pungent, less tangy, and nicer for it. Overall, I'd say that neat, it's a pretty good whisky. With just a splash of water, it's a very good whisky. 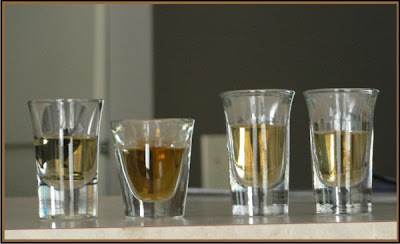 I'll be having some people over this week for a tasting party, so I'll pass on their judgements when I get the chance. Now, I've already got the cask started on its next assignment, but I'm going to leave you in suspense and post that tomorrow. But if you think really, really hard, I've left you a clue as to what it might be in this very post. Good hunting! I guess it's maybe a bit weird that I'd conclude the Whisky Works maturation project while listening to Bhangra. Some part of me feels that I should be listening to, I don't know, bagpipes or something to honour the homeland of great whisky. But I'm not exactly what you'd call known for doing things the normal or expected way. So Bhangra it is! I don't think Johnny Kalsi would mind. So here we are at the end of the Whisky Works maturation project. Don't worry: this isn't the end of experimentation with whisky; I've been having far too much fun to just wrap things up after my first batch. But it is the end of maturing the bottle of Whisky Works whisky that came with the cask. Which brings us to the title of this post. I had thought of subtitling it "Accursed Angels" but I can't really blame them for it. For the 350mL that are no longer in the bottle. I measured the amount of whisky that came out of the cask, and have 400mL exactly. That's a loss of 46.67% from the original 750mL Nearly 8 1.5oz shots. So, all in all, lots of contributions to the missing millilitres. If I had to estimate, I'd say about half of them were my own damned fault, and the rest went to those thirsty, thirsty angels. I'm not really too concerned or disappointed, though. It's still a strong whisky that will benefit from a splash of water. Most other whiskies I drink neat. So, even after a substantial reduction in volume, by factoring in a bit of water with each drink, I'm still getting plenty of enjoyment out of the bottle. This post is getting kind of long, and I still haven't got to talking about the whisky itself, so I'll shut up and get to the goods in the next post. Oh - I said I'd talk about the dribbles. Remember when I wrote about the dryness in the air here which I figured was causing some drying out of the cask which is turn was caused some dribbling? Well, some of that, it turns out, was just carelessness on my part. The rubber cork is not a cylinder: it's round in cross section, but tapered so that it's widest at the end which is inside the cask when it's plugged. However, I noticed that shoving the cork in all the way would allow a little bit of spirit to drip out, especially when it was upside down. This happens, I guess, because the cork is longer than the cask wall is thick. When the cork's in all the way, its widest part is inside the cask rather than shoved right against the wood. I discovered that there was a sweet spot for the bung: push only until you get a whole lot of friction, then stop. It's a difference of a millimetre or less, but it makes a difference. No dribbles! That's right. Barry at Premium Bottlers thought it was unfortunate that I didn't possess a proper whisky glass and very kindly sent one along. I've used these before at my favourite haunt here in Ottawa, and it's even nicer to be able to have a proper dram while flaked out in my comfy chair in my living room. Thanks, guys! The book under the glass, incidentally, is Histories by Herodotos. What can I say, I'm an archaeologist. I have peculiar books lying around. But on to more important things! My nose is working this week, so I can provide a much better description of what's going on. And I'm very pleased with the progress. The nose is fantastic. Dried cherries, toffee and chocolate all duke it out for which one dominates; none of them win. It's very nicely balanced. There are faint floral notes underneath the big three, and a suggestion of seaweed as well, and the faintest whiff of smoke. As I expected, the predominance of the alcohol on the nose has continued to mellow out, letting the other flavours shine. On the palate, it begins with a spicy oak, then chocolate, butter and dried fruit. I'd say cherries and raisins. It has a nice, long, warm finish where oak, chocolate and smoke alternate. It's still a bit hot for me, but another week will cool that down perfectly, I think. It has noticeably cooled over the last couple of months, which in turn is making it mellower and more subtle. The interplay between flavours is more up front, less camouflaged by the alcohol strength. Right now, I think it's ready to return to the bottle. I'd be very happy to drink it as it is, but I'm going to wait one more week. At the moment, most people I know are off doing Easter-related things, and it's more fun to have a party to celebrate the maturation of the Whisky Works whisky than it is to just bottle it on my own. So a whisky-tasting party at Château Ian next weekend! Do you have that famous synth riff stuck in your head now? Excellent. I figure if I'm gonna hit you with Right Said Fred, I might as well lay some Europe on you, too. One of these days I'll try to come up with a title based on music I actually listen to. Why "The Final Countdown?" Well, I have a week to decide what to do next with the cask. In a week, I'll have hit the eight week mark of maturation, and that will likely (though not definitely) be the end of the Whisky Works portion of the experiment. As I've said elsewhere, I have been graced with home-made apple cider. Free home-made apple cider no less. Should I go for making applejack out of it? Or should I go for trying to make McClelland Islay drinkable? I was out and about the other day and found a bottle at the LCBO, and happened to have the requisite $32 on me, so grabbed it. Even if it turns out disastrously, I only wasted $32 on the experiment, and hey, you never know. 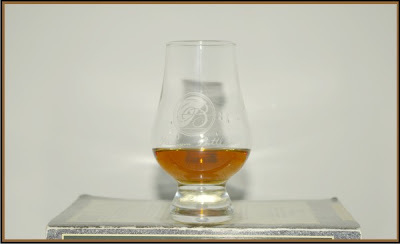 If it really is a 5-year old Bowmore, maybe a bit of maturation will make it rather tasty. So, folks: what would you rather have me write about next: applejack or whisky? Considering most of you found yourselves here by searching for whisky on the Internet, I have a sneaking suspicion what your answer will be, but it can't hurt to ask. I'm not shy about my appreciation of Oban 14. I like how it's not quite an Islay, not quite a Highland, but has hints of both. It's not overpowering. It won me over with subtlety and smoothness. It's got to be either my favourite or a close second. When I want robust and bold, it's Lagavulin. When I want smooth and sophisticated, it's Oban. So, in a celebrity deathmatch of sorts, I figured why not pit the Whisky Works against the Oban to see how it fares? I admit right from the start that I expected it to fare poorly, given the pedestal upon which I have perched Oban. I also admit that I was pleasantly surprised. Do you remember when I compared the Whisky Works to a Talisker 10 last week? I commented that both were nice, but the Talisker was the more delicate of the two, and the Whisky Work was the bolder. The same holds true here. If I can steal an analogy from music, I'd describe Whisky Works as a bass and Oban as a tenor. Whisky Works is the rhythm section; Oban is the soloist. There's a lightness to Oban. A grass-hay-seaweed-malt touch to the nose that seems, well, light. There's a bit of butter and salt, but nothing like the toffee and chocolate of the Whisky Works. Coming at it from the other direction, the Whisky Works is all over the bottom end of the nose: heavy fruits, toffee, chocolate. The first word I came up with for the nose of the Whisky Works in comparison was "deeper." It doesn't exhibit the fresh herbal scent that you can find in Oban. If it's there, it's been overpowered by the strength of the butterscotch-ish fruit. Both are quite nice on the nose, but are so unlike as to be only distant cousins. On the tongue, the Oban stands out right away as having a thicker texture. Weirdly enough, its light smokiness makes the smoke in the nose of the Whisky Works much more apparent. As was the case with the Talisker comparison of last week, it's difficult to parse the flavours of the Oban after a sip of the Whisky Works since the latter is such a strongly flavoured dram. The malt, the grain, the smoke - they're all there, they're all subtle, and they're all very well balanced. The Whisky Works is less gentle about things, but exhibits a longer finish with a greater spice and more vanilla. All in all, Oban still comes out ahead, though a 1-on-1 comparison is tough since Oban is a very subtle creature while Whisky Works is bold. I like them both for different reasons. After another couple of weeks in the cask, I expect some of the drama in the Whisky Works will have calmed down a bit. I imagine it will always remain a more strongly-flavoured whisky regardless of how long it's left in the cask, but a bit longer being infused with casky goodness won't hurt, and might make it a mellower dram. And in my book, mellow is a good thing. Usually, when pouring something from a spigot, there's a single drop which hangs on for a while after you've finished pouring whatever it is you're, well, pouring. Typically, I'm too impatient to sit there and wait for the droplet to fall into the glass, so I just run my finger below the spigot to collect it. It's true: the first taste each week in this entire process has been a single drop on my index finger. Well, I never felt it was really important. I guess it's still unremarkable, but this week something happened which I think is worth reporting. I caught the droplet of 5-week-old whisky on my finger, stuck it in my mouth. And thought wow. Things are coming along very nicely. I'm almost inclined to title this post "greatness gracious" but that sounds funny. And I desperately try to avoid sounding funny. Ask anyone who knows me. It's true. I'm not going to bother with a photo of the whisky against its unaged self this week, since it looks pretty much the same as last week and the week before. It's not changing in appearance any further, at least to my untrained eye. The nose, though, is really coming into its own. There's toffee. Lots of it. A very smooth sweetness that's got just a hint of butter and saltiness to it. Some cooked fruit still, but it's being overtaken by the toffee. Lots of vanilla, undertones of milk chocolate (rather than dark chocolate like I'd found earlier), a whiff of a sea breeze over a grassy field. A quick swirl of the whisky around the glass really kicks up the butterscotch, with raisin undertones. Think rich and sweet but not cloying or acidic or fruity. Not as smoky as I had expected, given the charred changes to the water and to the sherry over its three weeks, but I'm not complaining. Very nice. Very nice indeed. The immature spirit just smells watery in comparison now. There's not much there in comparison. Wet straw, grain, a bit of smoke, but it's all faint. I'm stunned at how much the nose has changed over 5 short weeks. Stunned, and pleased. The taste is also coming along nicely. It still has more alcohol than I'd like in it, meaning it's a bit hot still, but it's really moving in the right direction. It starts with a spicy warmth, then nice, clean oak. Cinnamon and raisins are next, with a malty and smoky undercurrent. The finish starts with cooked cherries for just a second, then fades to cinnamon and brown sugar. And underneath everything is a nice buttery vanilla, fainter than on the nose, but unmistakable. A splash of water really cools the heat, allowing the other flavours to come forward. Although I usually drink my whisky neat, I'd be willing to make an exception here. The spicy heat is nice, but a bit heavy. Water cuts it right down, and the dram is really nicely balanced.